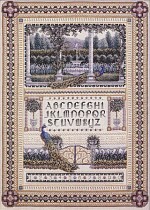 A large, intricate sampler featuring architectural elements and motifs inspired by formal English gardens. A tranquil scene with fountain and peacock is framed by rose-covered marble pillars. The alphabet is stitched over one in shades of green, and is flanked by topiaries. Another peacock perches atop fencing closed with a gold filagree-work gate. The scenes are separated by bands of specialty stitch motifs. A wide border featuring cut-work, specialty stitches and beads finishes the piece.